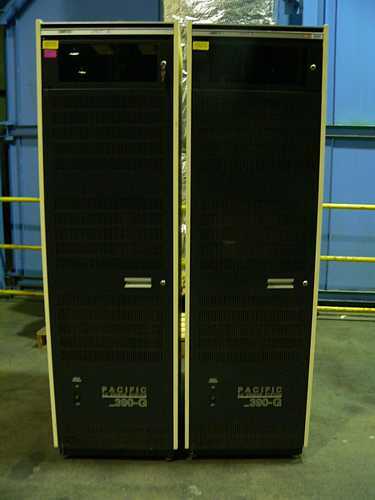 The goal of this page is to give the status and capabilities of the Pacific Power 390-G AC Power Source for 50 Hz power to the (German) IBM 1401 system. - contact - And our technical support person at Pacific Power is Mitch Orr, (949) 251-1800 x124. Mitchel Orr @ PacificPower.com - He remembers this box from 20 years ago..
Also, the 1402's master AC power relay clicks on nice & briskly now. The 1402's ferro-resonant transformers even sound happier. On Weds, we'll re-attach the 1406 extended memory and run a 729. And if Frank is in, power the 1403 again. Although we still have more testing to do, we're off to an auspicious start. 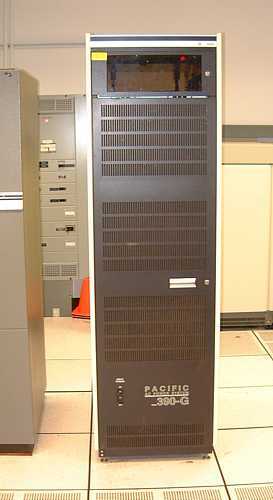 Dave, Gary - Thanks for recommending the unit to us, shepherding it during its last months at IBM San Jose, making the Museum aware that we could bid on it, and providing documentation & technical support contact information. You guys were right - it's a fine product. Mitchel (@Pacific Power) - Thanks for answering our long list of questions, we really appreciate the support! Your unit is still pulling a load after 30 years! Jim Yee [via wireless connection] - Thanks for the severals days of installing the new AC power wiring and circuit breakers! Grant - Thanks for supporting our decision to bid on the Pacific Power. Reports have been trickling in that the wall (NEMA box) circuit breaker(s) that feed the Pacific Power converter have sometimes tripped on initial closure. We have been using this circuit breaker as a main switch, partially to make starting the German 1401 a little harder to power-up by an unauthorized person. Ron Crane came in on Monday (Aug 8, 2016) and measured the current draw of the Pacific Power system (PPS) with the German 1401 running. 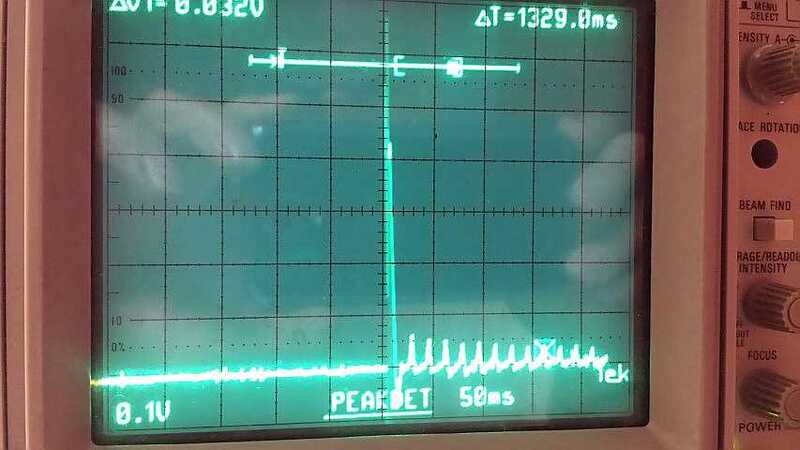 This picture shows the steady state draw (at 20 Amps/div.) with the 1401 on, but not many peripherals. The current draw on the three phases was 24, 25, and 26 Amps RMS well within the range of the existing 90 amp circuit breaker. The current probe was a Fluke i410. This picture shows an inrush current peak of about 600 Amps (100 amps/div. ) 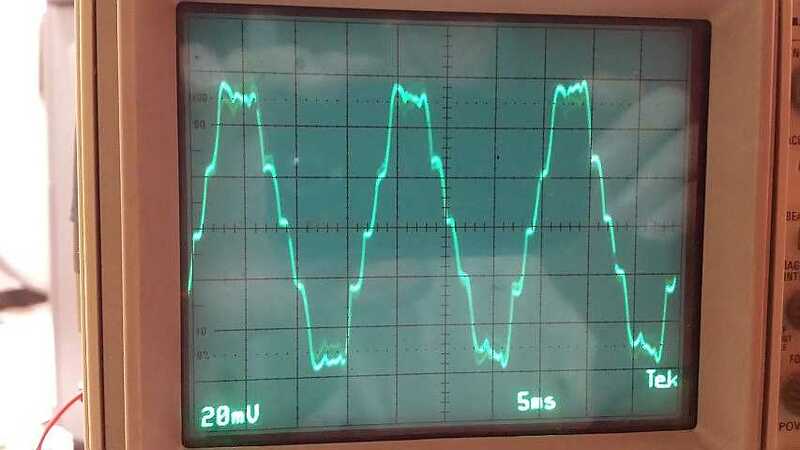 for less than a half cycle of the AC input waveform. This is why the lights blink and the circuit breaker will trip. This is the nature of the Pacific System and not a flaw in the system. 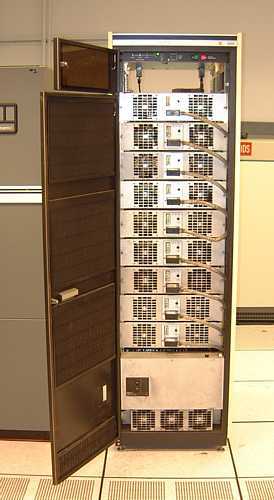 The existing three phase 90 amp circuit breaker for the Pacific System is a HACR breaker already. 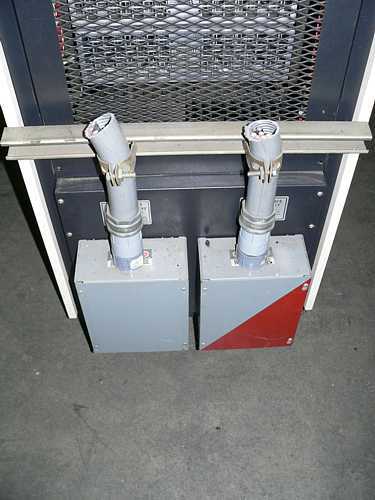 (Heating Air Conditioning Refrigeration) These are designed to withstand inrush currents. The rating of the existing 90 amp circuit breaker is correct of the wire gauge between the power panel and the Pacific System. It is believed that the circuit breaker is worn from so many switching on and off that it has weakened needs to be replaced. You can forward this e-mail to your electrical contractor. Please let me know if you or the contractor has any further questions.